Look at this delicious breakfast! 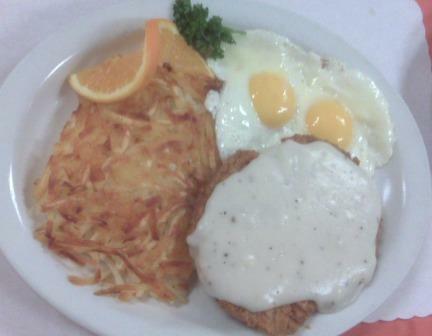 Our tasty chicken fried steak is served with gravy, two eggs your way and hash browns. The one pictured is served with two eggs sunny side up. At under $10, this breakfast is not only hot and filling but affordable! This entry was posted on Saturday, October 31st, 2009 at 7:32 AM and is filed under Breakfast. Tagged: chicken fried steak, eggs. You can feed this entry. You can leave a response, or trackback from your own site. « Who needs fast food? Try Maggie’s breakfast sandwich!